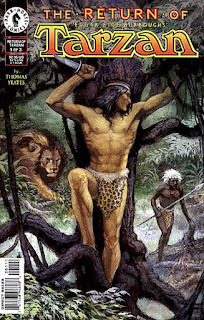 With The Legend of Tarzan coming I thought it would be time to start digging into past takes of Edgar Rice Burroughs' classic character so let's start with Thomas Yeates' adaptation of the second novel. Yeates actually starts his version by skipping over most of the novel's first 1/3rd, providing only a brief paragraph and some narration to help catch up the story. Here we find Tarzan surviving being dumped overboard by Rockoff and swimming ashore to discover he's back home, complete with the cabin built by his father. 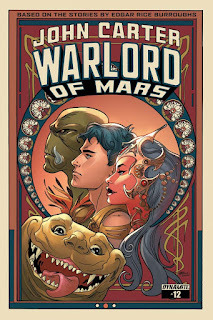 This first issue details his first encounters with the Waziri, his becoming part of the tribe and helping them against slave raiders and a rival cannibal tribe before he heads off to Opar. The main draw here is Yeates' beautiful artwork, capturing the jungle and Tarzan in a vivid style that helps propel the story. It's just eye-catching and stunning to look at, especially compared to some of the other Tarzan comic books of the past and since this series publication in 1997. I can't say enough good things about it. As for the story Yeates is smart in condensing the story and removing a lot of the subplots that bog down the novel. I admit that The Return of Tarzan is a convoluted novel that probably established Burroughs' reputation as being an episodic novelist since it bounces from plot to plot until Tarzan does return to the jungle. Removing all of that helps setup the story quicker and get us the major story so I didn't mind the choice here. If you don't have this issue and the other two in the series track them down and hope that Dark Horse publishes a compilation at some point (maybe to tie in with the upcoming movie). Until next time folks.